Microfiber Floor Mop. This 18” professional mop with six-foot adjustable stainless steel handle comes with two microfiber wet mop pads, one dust mop microfiber pad and two free microfiber cloths. All of the pads and cloths that come with this mop are machine washable, which makes it easy to keep your floors super clean all the time. Elite Tech Gear Microfiber Cloths. 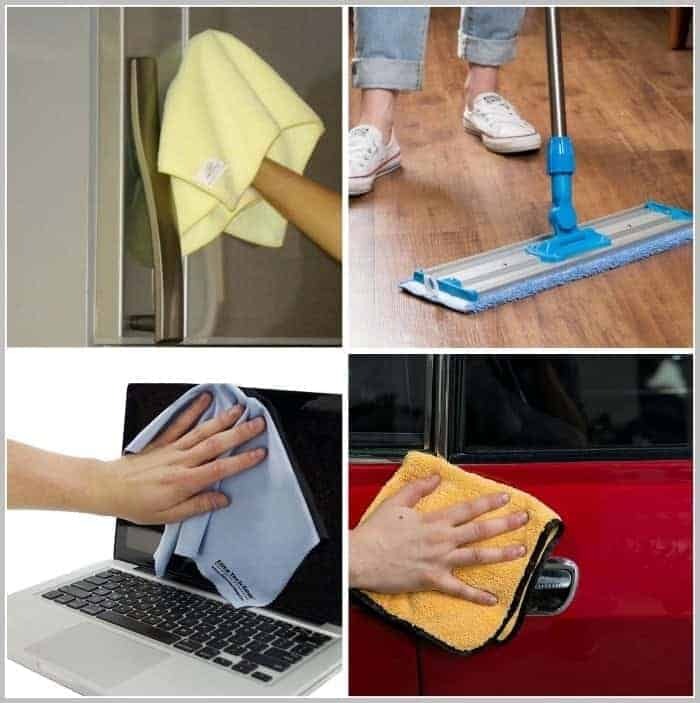 This is the most amazing microfiber cleaning cloth specific for cleaning electronic device screens, eyeglasses and other extremely delicate surfaces—in a usable size and at an affordable price. This isn’t one of those tiny scraps of fabric like the one that came with your new eyeglasses. At 12” x 12”, an Elite Cloth is the right size and quality to clean your big screen TV, your eyeglasses and mobile phone screen, too. This cloth is ultra-fine microfiber, which means it will not scratch even the most delicate surface, leaving it crystal clear and squeaky clean, too. Chemical Guys Professional Grade Microfiber Towel. Using old towels from around the house to wash and detail your car is one way to do it, but not the best idea if your time is valuable and you’d rather not end up with new scratches on the paint in the process. Microfiber towels are a much better idea. A good microfiber towel will not harm the paint, cuts the job of toweling off a car in half and as a bonus, leaves no streaks or scratches behind. For this big job you need a microfiber towel of equal size. Chemical Guys microfiber 16” x 24” 70/30 towels are made from the best, softest lint-free materials.